I gave Nottingham City Council a helping hand with their recent smear campaign to vilify society’s most vulnerable. They didn’t really need my help because they were already doing a sterling job without me. However, we all need to come together during these dark and troubled times. Recent illustrations for Nottingham's Left Lion magazine. Continuing the Where's Robin theme from 2009. They can be seen in issues 29 and 34. You probably weren't aware that Nottingham is home to the UK headquarters of one of the world's largest arms manufacturers. 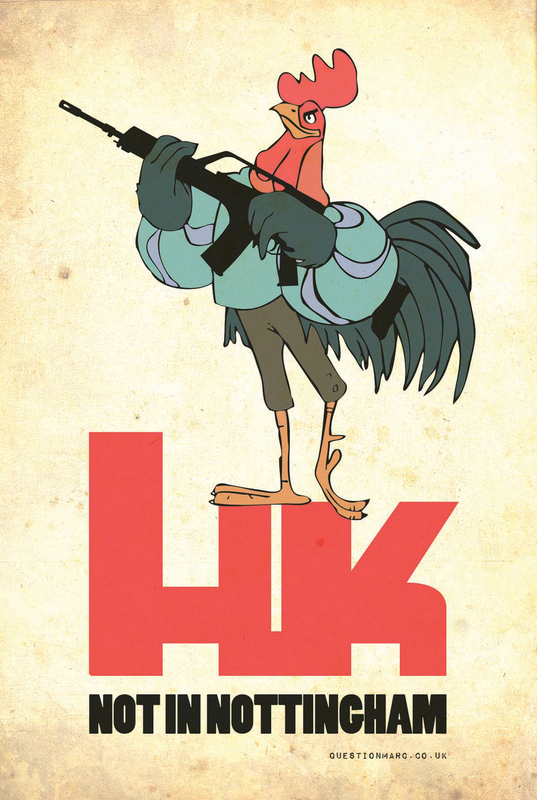 The company is called Heckler and Koch and they are based at an unmarked warehouse on the Lenton industrial estate. This poster was designed as a subliminal awareness raiser that the corrupt firm continue to operate from our city. Download the high resolution artwork here. In Max Clifford We Trust. On a wall in Nottingham city centre. This piece was broadcast to the world via the BBC Market Square Webcam. The images refresh every few minutes, however they take longer to update at night; so long in fact, they allegedly photoshopped out the offending word! An artistic representation of the modern city landscape. Visit Nottingham where you can look at a castle that's not really a castle, stand outside museums that shut down years ago and have your picture taken with a broken statue of Robin Hood. 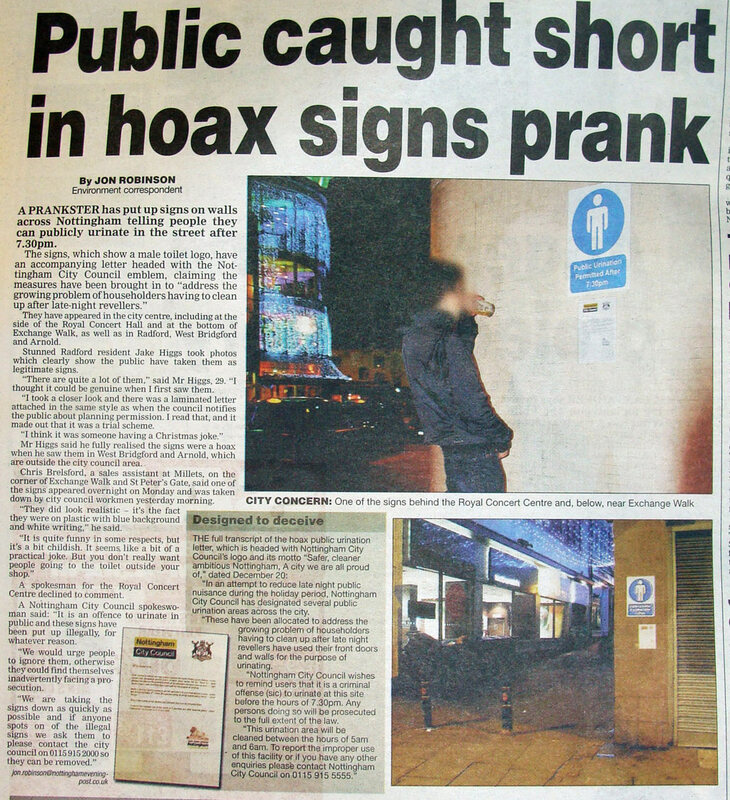 Public Urination signs appear accross Nottingham during Christmas 2008 accompanied by a letter from the council. Lasted between six hours and seven days.